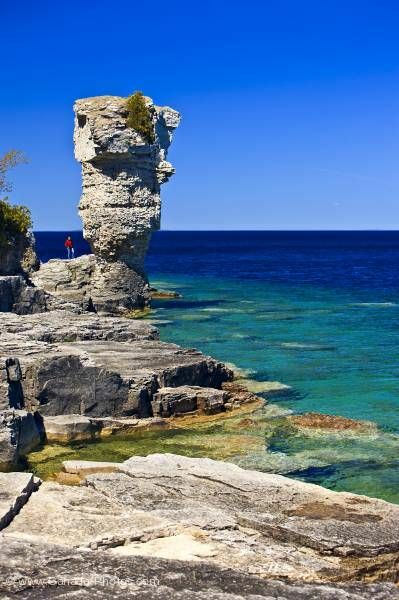 A tourist has hiked their way across Flowerpot Island to the sea stack which stands near the shore of Lake Huron in Fathom Five National Park in Ontario, Canada. Along the shoreline of Flowerpot Island, there are two natural sea stacks which have been named flowerpots due to their appearance which has been formed over the years by the forces of nature. One of the sea stacks is 23 feet high with the other one towering above at 39 feet high. To reach Flowerpot Island in Fathom Five National Park to view the sea stacks, one must board a zodiac or a glass bottomed boat. A hiking trail makes its way around Flowerpot Island which is a beautiful way to spend the day surrounded by the breathtaking scenery of Lake Huron. Picture of a tourist at a sea stack on Flowerpot Island in Fathom Five National Marine Park, Ontario.